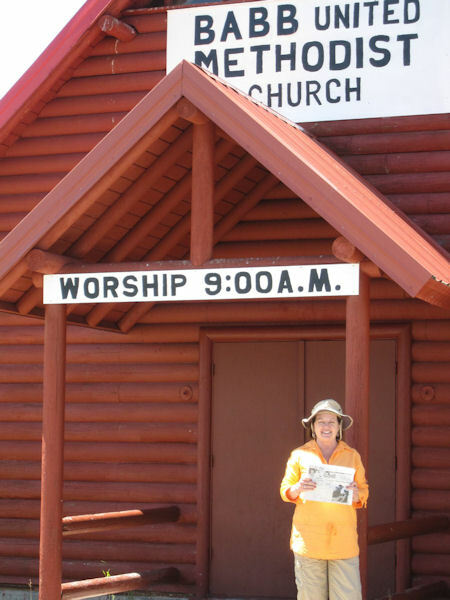 Susan Javorsky of Parkville, Missouri took "The Quill" along to the Babb United Methodist Church on the Blackfeet Reservation near Glacier National Park in northwest Montana. It was in July of 1966, that she (then Susan Martin) lived in Stronghurst and had spent July 1966 with the Methodist Youth Fellowship living in teepees helping to build this church along with Rev. Irv Kenyon family and John Powell from the Stronghurst UM church, Jean Steck and Kendall Hetrick from the Carman UM church, and Laura Lee Eckhart from Disco with other ministers and youth from Basco, Nauvoo, Warsaw and Carthage. Susan and her husband recently retired from the BNSF Railway and are touring America's National Parks. On July 15, 2010, their 33rd wedding anniversary, they stopped in Babb and reaffirmed their wedding vows on the steps to the church.